The book that made a legend--and capture's America's sport in detail that's never been matched, now featuring an introduction by Tom Wolfe aand never-before-seen content from the Plimpton Archives. 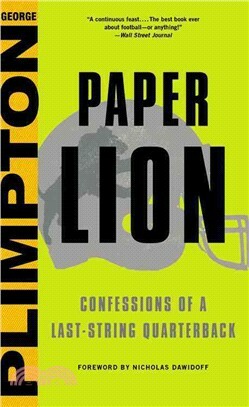 One of the funniest and most insightful books ever written on football, PAPER LION is a classic look at the gridiron game and a bookThe Wall Street Journal calls "a continuous feast...The best book ever about football--or anything!" George Plimpton (1927-2003) was the bestselling author and editor of nearly thirty books, as well as the cofounder, publisher, and editor of theParis Review. He wrote regularly for such magazines as Sports Illustratedand Esquire, and he appeared numerous times in films and on television.